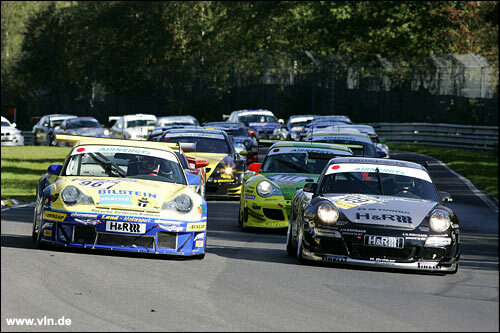 At 3.5 hours, the Barbarossapreis is the shortest race of the 2006 German Endurance Championship season. It was still long enough to take its toll on several front-running teams. Former DTM driver, Peter Dumbreck and long time Falken associate Dirk Schoysman drove a Nissan Z33 in this event, the winning car in the Tokachi 24 Hours earlier this year. Currently still in Super Taikyu specification, this will be the new challenger for the Falken team at the Nürburgring 24 Hours in 2007, as successor of the venerable Skyline GT-R. From the 26th spot on the grid, the car's first result was an 87th place, some four laps behind the leader. After the race the car reportedly went straight back to Japan where the engineers are now going to work. Meanwhile, others made the pace: Land Motorsport drivers Marc Basseng and Patrick Simon secured pole position, and never once missed a beat throughout the race. The Porsche 996 GT3 RSR crossed the line with a healthy advantage of more than three minutes over the second-placed finisher. This second place, however, was very hotly contested. A number of potentially competitive cars bowed out of the event early on. 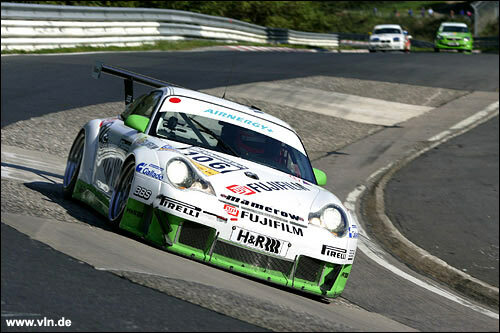 Armin Hahne made a return visit to Nordschleife racing, sharing the Manthey Porsche with Arno Klasen - they only lasted one lap. 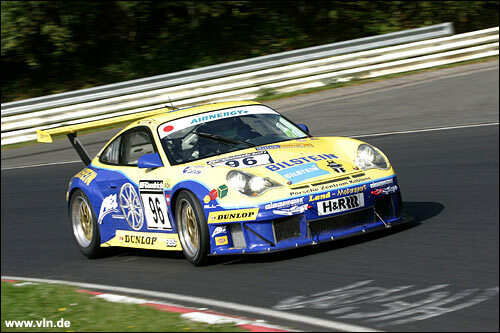 Porsche 997 team Sabine Schmitz / Klaus Abbelen managed three laps before a driveshaft broke, and the same happened to the ex-DTM Opel Astra of Volker Strycek, Andreas and Ralf Schall. 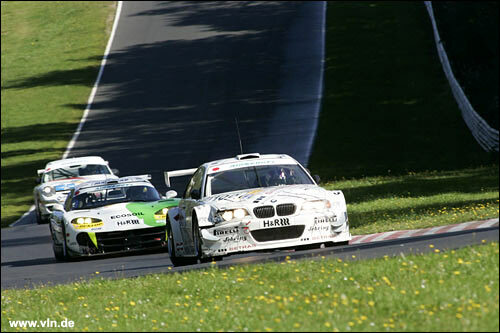 The Getrag BMW M3 (below) once again took on the remaining Porsche armada for the runner-up spot. Markus Gedlich, Michael Bäder and Tobias Hagenmeyer are on a confidence high since their victory in the 6 Hours, and they were right on the pace again this time. 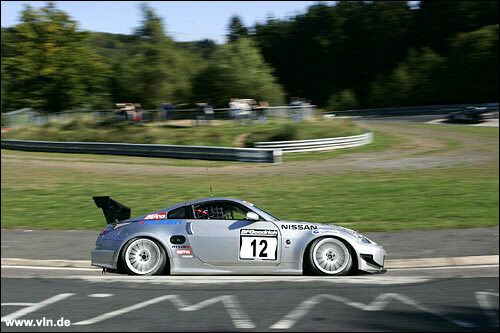 Jürgen Alzen had other ideas about this, he shared his Porsche 997 with Thomas Messer while brother Uwe was away on other duties. Also running strongly was the father-and-son team of Peter and Christian Mamerow; these three teams were locked in combat at the end of the race, and it went all the way to the flag. Smoke signs can be deceptive: going into the last lap, Christian Mamerow (above) had taken second place from Thomas Messer and was now nursing his car home with a wheel hub showing signs of imminent failure. On a last minute charge, Tobias Hagenmeyer misread the smoke emanating from that faulty hub as the precursor of an engine problem on his opponent's car, and decided to wait for the Porsche's demise. By the time he realised his mistake, it was too late, by 0.8 seconds. Even with Porsches taking most of the glory in the individual races, the battle for the overall title is still between two BMWs, and nothing is decided yet. Defending champion Claudia Hürtgen and her team-mate Marc Hennerici in the Schubert Motors BMW 120d won her class for the seventh time in a row, and are now ahead of Wolf Silvester and former champion Mario Merten in their production-class 325i. The next race will again be a 4 hour affair, on October 14.